This looks amazing! One question – I can’t get stevia where I live (sub-Saharan Africa), so have to rely on honey, coconut/brown/cane sugars, dates and maple syrup as sweetners. Any idea what I could replace the stevia in the cake and “frosting” recipes with? Should I just increase the honey? 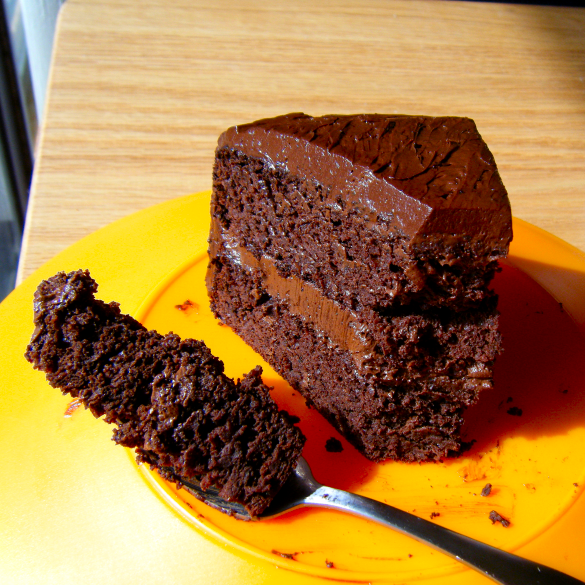 You will love this cake, it is so moist. I think you’d be fine just using a little more honey for added sweetness. Enjoy! So sorry to hear the trusting wasn’t great. I have made it with avocadoes that weren’t perfectly ripe and have also been disappointed. Otherwise it typically works out well. Tough to know for sure what may have made it so bad but glad you enjoyed the cake. How long will the avacado frosting last in the fridge? Hi Nora, I know we’ve kept ours refrigerated for at least a couple of days. There’s another recipe that is great which I haven’t yet posted that is chocolate mousse/frosting which involves mixing 1 can of coconut milk, 1 cup of dates, 4 drops of vanilla extract and 5 tablespoons of cocoa. Blend these in a high speed blender and you get a great little frosting. This will last refrigerated as well for a couple of days. Hope this helps! This mousse frosting sounds lovely. Does it hold like buttercream icing? Or is it runny? The only thing about this mousse is that the avocadoes have to be the perfect ripeness. When they are, the icing tastes wonderful. You can always adjust the sweetness to your desired level. The consistency of it holds up well and isn’t runny, it is the consistency of a mousse. Any substitute for the eggs in the cake recipe? You can use a chia egg or flax egg as a substitute. The following is a link for how to make that substitute. I was wondering do I have to use whole eggs or can I just use egg whites? Thanks! Hi, I haven’t tried making this recipe without the entire egg so can not tell you how it would turn out. I don’t hesitate using this many eggs in the recipe as recent studies have shown eggs provide many health benefits. This was good to hear because we were taught for so many years to avoid them. If you are avoiding the whole egg for health reasons, you can have a look at this article for further information should that be of interest to you. Hope you enjoy your baking! http://articles.mercola.com/sites/articles/archive/2005/04/13/egg-myths.aspx#! I wish I could say for sure but of the many times I have made it, people have been very pleased with the taste. Taste is something that is different for everyone but I do hope you give it a try and maybe even the night before you want to eat it. The taste seems to improve on the second day for some reason. Hope you enjoy it! Hi! This recipe is high in protein and low on the glycemic index so for that reason I would say it is quite diabetic friendly. Stevia is a sweetener that does not affect your blood sugar. The relatively small amount of sweetener present in this recipe (either in the form of honey or maple syrup) can be offset by the high amount of protein from the bean and the eggs. Hope you enjoy it! I can’t wait to give this a try. Will the frosting/chocolate mousse recipe be enough for a two-layer cake like you did, or just one? The frosting should be enough for the two-layer cake. I believe that is how much I use when I make it. Haven’t made it with the frosting in a while! The cake was Delish ! This looks amazing! My mother-in-law is hypoglycemic and can’t have any type of processed sugars, so this is just what I was looking for! I was wondering if you could substitute butter for the avocado in the frosting? If so, how much butter? Thanks!! I’m not sure about butter as a substitute but it might work. I wish I had more experience with it to tell you yes or no. You might want to try coconut butter (found in most health food stores and even some local grocery stores in the organic section. Best of luck! Thank you for sharing this recipe. My husband and I are watching our carbs and we like a little something sweet with coffee in the evening. I used a sugar free maple syrup instead of the honey and added some Splenda brown sugar for a little more sweetness. I didn’t frost it and we like to top it with some whip cream. My husband was surprised when I told him the base was black beans. He says the recipe is a keeper and wants it again. So glad you enjoyed it. One of the sweeteners I like to use that doesn’t spike your blood sugar and is naturally derived from North American hardwood is called xylitol by the brand Xyla. It can be found in most health food stores and now in the organic section of grocery stores. It has the closest taste to real sugar but without the damaging effects of some of the artificial sweeteners. Stevia is also another great one but a little more difficult to get just right since it can sometimes have a bitter aftertaste. All the best on your wellness journey! do you know how many WW points plus a serving has with and without frosting, and what kind of texture does the cake have? The cake turned out great for me. Very easy to make! The frosting on the other hand was a little more difficult I felt. It all mixed together very well, but had a very bitter taste. The only thing I didn’t add was the Stevia. The recipe says it is optional, and I don’t really care for the flavor so I didn’t use it. It had a very bitter, avocado taste so I added a lot more honey, coconut sugar, and a little more cocoa and vanilla. It helped a little but never took the avocado flavor away completely. Did I do something wrong or is that just the way it turns out no matter what? Thank you! I will try the mousse recipe. This cake is absolutely fantastic and my children and picky non Celiac husband enjoyed it as well. For someone who is a terrible baker, this turned out really well and I would recommend everyone to try this out for yourself, it’s worth it! Happy to hear it turned out well for you. Thanks for sharing! Looks like a great recipe but 1 tablespoon is a lot of vanilla, should it be 1 teaspoon? Yes it does seem like a lot but 1 tablespoon is correct. Ok perfect! I used 2 tablespoons for 2 layers and just pulled them out of the oven, they look and smell fantastic. By the way the frosting tastes just amazing! I’ll never go back to icing sugar ever again! Thank you so much for this recipe! I can’t wait to taste the cake tonight! Do you have the nutrition information? Maybe I missed it? That’s true. I’ll put it in my firness pal to get the nutritional breakdown. Thanks! I’m trying this out for my son’s first birthday cake…I just edited used 1/3 cup of honey and threw in a very ripe banana to make up the difference. .hoping it turns out good! Also making it into cupcakes and a small cake/oversized cupcake…we shall see how this affects cook time. ..thanks for posting! What a great idea…let us know if it’s a success! Hi there, am wondering if you know the substitution amount if I was to use xyletol instead of stevia? AM very excited to try this! You can use a tablespoon or so of xylitol as a substitute for stevia. It’s all about the level of sweetness you’re used to and whether you’ll be using frosting or not. I think you should be good with that amount of xylitol as far as sweetness. True. It is important to watch total carbohydrates for everyone especially in a case of diabetes. However, in this case with the black beans (in a 1/2 cup), there are 23 grams of carbohydrates, 6 grams of fibre and 9 grams of protein. The net carbohydrate (total carbs – fibre) effect would be much less of an insulin load than in a traditional cake made with wheat flour and regular sugar. It is so wonderful that your daughter has a mom so conscientious about her health. Thanks for sharing! Any idea of a swap for the honey? My jar says it has 18 grams of sugar per tbls be well honey brand. I sometimes use a combo of honey and xylitol since that doesn’t have an effect in your blood sugar. Aside from that, it is difficult from a taste perspective to avoid it altogether. Hi. I always want to try something like this but I’m lost about how much is 1-15 ounces. it is a pound and 15 onces? Sorry, I use kilograms. Could you please update the post with this change? It still says 19 oz can. Thanks! Hi! I’m super excited I try this out – looks delicious! Do you happen to know any of the nutritional information for this recipe? Calories/fat/protein/iron, etc? No worries if not, was just curious!! Hi, I do not have the nutritional info for this recipe. It is however all whole food based which in my opinion makes this less of a concern. Best of luck with the recipe! I made these, got 14 cupcakes. I subbed 2 eggs for flax eggs and didn’t have stevia or enough honey at hand so added a cup of sugar . It came out very moist to but my friends said it was just the right amount of moistness. No bean taste at all. I didn’t use any frosting. Love the idea! 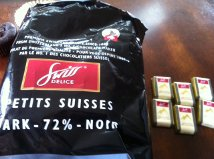 I am making a birthday cake for a diabetic child who loves chocolate. I was wondering if the icing had to be refrigerated? Thanks for posting the recipe! Yes the frosting will be best if refrigerated as there are avocados in it so you will want to keep it fresh. Enjoy! Hi, you can use maple syrup instead if you’d like. I’m a little resistant to plain sugar as we don’t have any in our house for many reasons. Coconut sugar could also work, it may just need a little added liquid to make the consistency ideal. Good luck! Due to dietary restrictions (and plain ‘ole desire to eat healthier ;)….I’m super excited to have found this recipe for my son’s birthday tomorrow!! I’ve had black bean brownies but never cake! I need to make it today, for the party tomorrow, and was wondering if it should be refrigerated overnight or left on counter for best results? Thanks!!! Can I make use my muffin pan for this recipe? If you are asking about making muffins using this recipe, yes…I do it all the time! I am looking forward to trying this! About how long do you bake for cupcakes? They should be done around 15-20 minutes. Just press lightly on the top of the cupcake to see if it indents and if not, it should be ready. Enjoy! Thank you! I just took these out of the oven (muffins) to have for breakfast tomorrow. Everyone is excited! Could you use the doubled recipe in a 9 x 13 pan ? Hi, yes that should work well! I made this cake was very tasty but it was a bit dry. Any tips? Thanks. I’m not sure why it turned out dry. Maybe take it out a few minutes sooner and leave it in the pan to let it cook a little longer. That may help it stay a little more moist. I sometimes in a pinch will make this recipe quickly and just throw all the ingredients in the Vitamix and blending it this way makes it moist for me. Good luck, glad you found it tasty! I was SO happy with this recipe! I tried a brownie recipe with black beans once & it put me OFF black beans & brownies for a good part of a year! But this was delicious. I didn’t try the mouse icing yet but the cake was wonderful. ~ One question; the recipe calls for 1-18 ounce can of black beans & all the cans I can find are 15 ounce cans. I ended up adding a couple spoonfuls from a second can but wondered if this was a typo or if your cans are just different than mine. I use organic so maybe it is a slightly smaller can??? Curious. You’re absolutely right, the small cans are all 15 oz. I think I used the large can when writing this recipe but don’t have it with me right now to verify. I often double this recipe when I make it and the amount of black beans I use varies so I have used anywhere from 2 cans per recipe to give me the 2 cups to 1 1/2 cans without much variation in the recipe. Glad you enjoyed it! This is awesome!!!! I too am a huge health nerd who loves to bake. I made this for my dad’s birthday and it was a hit!!!! I forgot to check how much it yields though and put it in a big pan then had to move it to my smaller pan. Thank you so much for posting this!!! Good question! I would like to know as well because we are going on a 3-day vacation and I would need the cake the day after we come back. Yes I freeze them all the time. Just make sure they are thawed completely before you serve them otherwise they have a funny texture. Once thawed they are like freshly baked. Hi this recipe looks great! But I don’t have stevie extract and since it only asks for a teaspoon, I was wondering if I could just omit it or replace with something else? Would that effect the flavor or texture too much? I don’t want it to be bland or anything. The stevia is purely used as a sweetener in this recipe and I have lately been using more xylitol which comes in powdered form. I always avoid using plain white sugar to keep recipes low glycemic. You may need a little extra added sweetness if you omit the stevia but xylitol is another great substitute. Enjoy the recipe! A friend made this cake for me for my birthday today!!! It was absolutely amazing!!!! Can I use rice malt syrup instead of honey do you think? I’m sure you can, I’ve never tried it but it would be just as sweet tasting. Pingback: 5 Recipes for well-being – Healthy eating on our Pinterest board… « let's talk! WOW! This recipe is absolutely amazing! I have 3 kids who are very good at detecting “healthier desserts.” This cake went right under their radar! They were begging to lick the spoon and begging to try it as soon as it was frosted. I did use the second frosting recipe with the dates. It was slightly loose, but delicious nonetheless. Thanks so much for sharing this treasure 😄. 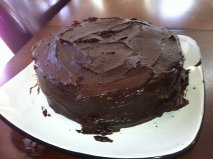 It may be the only chocolate cake recipe I ever use! Would maple syrup work in place of stevia or honey. ? Yes in fact I used maple syrup in place of honey just today. I’m vegan. Will an egg substitute work as well? I’ve never tried it but I don’t see why not. I think it should work. I made these earlier, I had enough batter to make 18 cupcakes. Love how moist they are, thank you! This cake was FABULOUS!!! I fooled everyone with it and they loved it!! I did use the coconut milk icing recipe as my husband hates avocados but I guarantee he wouldn’t have known it. Just yummy!!!! Was hard not to eat the whole thing! When making the coconut milk frosting, can you substitute anything for the dates? I’m not sure but the texture and sweetness of dates might be difficult to match. This cake is phenomenal and everyone who has tried it has raved about it! My favorite dessert!! However, for icing/frosting I prefer to use 6 TBSP of cacao raw chocolate, 3/4 cup of pure organic maple syrup, 1/3 cup melted coconut oil, 1 tsp of vanilla extract and a pinch of sea salt. Whisk till well blended, then spread over cake or cupcakes. YUMMM! How about calories per slice? Want to try, looks yummy!! Contrary to common practice, I never look at calories but I focus on sugar content and protein amounts. This of course along with real food ingredients are key in helping me decide what I will bake for my family. This recipe meets all those requirements. Enjoy! If you try the app called “my fitness pal” you’re able to put in your recipes and have the app calculate the calories/portion etc. It’s a free app too. Our oncologist has put my hubby on a low GI diet to help with chemo. Our boys really love chocolate and I would love to make everyone happy on the cake/ sweets front. Wondering if you have ever tried coconut palm sugar instead of honey in this cake recipe? Yes from a taste perspective you would be ok. Not sure how the liquid ratio would be but you should be just fine. Xylitol especially from brands like Xyla is derived from North Anerican hardwood and does not affect blood sugar but tastes sweet. You could also do half and half with it and honey or coconut palm sugar. Good luck! Happy to hear you have a more progressive oncologist making such recommendations about low GI diet! Hi Heather, I would make these cupcakes for everyone. They won’t know the difference and will taste delicious! Love this cake. Made it for my daughter’s 5th birthday last year, and am making it for her birthday again tomorrow. Very easy and delicious, everyone loved it. Going to top it with fresh raspberries and blueberries this time. Curious to find out if there are substitution for avocado (I realize it’s a key ingredient). Unfortunately it’s a food trigger for my fatty liver ironically, can’t digest it what so ever. Will definitely try the cake workout the frosting tho! I know the kids will love it and boost their proteins. 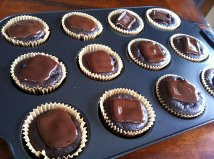 I sometimes just use the dark chocolate pieces from Costco 72% and place them on each cupcake when I take them out of the oven to let them melt as a frosting substitute. Can you sub Erythritol or the Xylitol? I’m hoping so, I just tried it. However, the batter came out very “liquidy”. Was it because of that or did I do something else wrong? I’m hoping the cake turned out well despite the liquid texture. I’m quite sure you can substitute erythritol for xylitol. I’m not sure why your batter came out that the at though. Sodium aluminum sulfate makes about 20-25% of baking powder according to Wiki. I avoid aluminum in as many products I can whether it’s a product I apply on my skin or cook with. I do however use regular baking powder often as it can be difficult at times to find the aluminum free version. I have a 15 oz can of black beans, will that work for this or will I need more?? Yes it should work fine. I don’t always find the right size can either and the recipe seems quite flexible with the slight variations in amount of black beans used. It makes about a dozen cupcakes. We made this in the office, was amazing!